I only watched this within the last six months as they were all on Netflix. I really really liked the first season, and was quite disappointed with this second season. 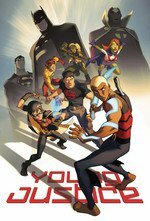 I felt the first season was primarily character driven, and lots of nuance, interesting things to say about growing up and the relationship between adults and teens, and the characters had interesting arcs. That.... obviously didn't work for Warner Bros as I felt the second season chucked all that aside for a far more typical kids show. The plots were simplistic and no longer driven by the feelings of the characters, the emotional arcs were far more pat and one dimensional, and most heinously, I really didn't like what they ended up doing with the female characters in the second season, I felt they really diminished them. Currently rewatching, don't have much to say yet, but It's interesting to see how the teams have progressed.